The Islamic Development Bank (IDB), set to invest $98 million (N19.5bn) in Bilingual Education Project in nine Nigerian states. The President of the group, Ahmad Ali, made the disclosure, Saturday, when he led other executives of the bank to host the Emir of Kano, Muhammadu Sanusi, at the organisation’s headquarters in Jeddah, Saudi Arabia. The Kano emir is in Saudi Arabia as Nigeria’s amirul hajj where he and his committee are paying for their expenses. The IDB boss listed the states that would benefit from the investment to include Adamawa, Borno, Gombe, Kaduna, Kano, Kwara, Nasarawa, Niger and Osun states. “This project was successful in Niger and Chad republics where the Madrasa and Quranic schools were worked upon in such a way that it facilitated the graduates of the schools to enrol in public schools. “The establishment of this program will help Nigeria overcome some of its education challenges like illiteracy and also to enable those that learned in the Madrasa to be integrated into public schools,” he said. The acting country manager, Sierra Leone IDB Mamoud Kamara, said the BEP has been approved in nine countries – Senegal, Gambia, Mali, Burkina Faso, Niger, Chad, Nigeria, Djibouti and Somalia – while seven others – Guinea, Sierra Leone, Cote D’Ivoire, Togo, Benin, Cameroun and Comoros – have formalized the requests. 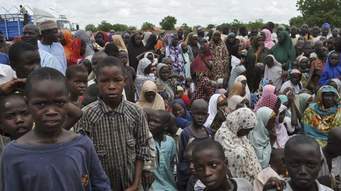 He lamented that one in six out-of-school children worldwide are in Nigeria. Mr. Kamara, who is also the Manager, West Africa Region Country Programs of the IDB, said the project would lead to the building of 30 modern schools with 720 classrooms, 30 ICT labs, training of 1800 teachers and provision of 1.7 million textbooks among others. Responding, Mr. Sanusi said he would take the project as a personal responsibility and work towards getting the necessary approvals and actualization in the interest of Nigeria.